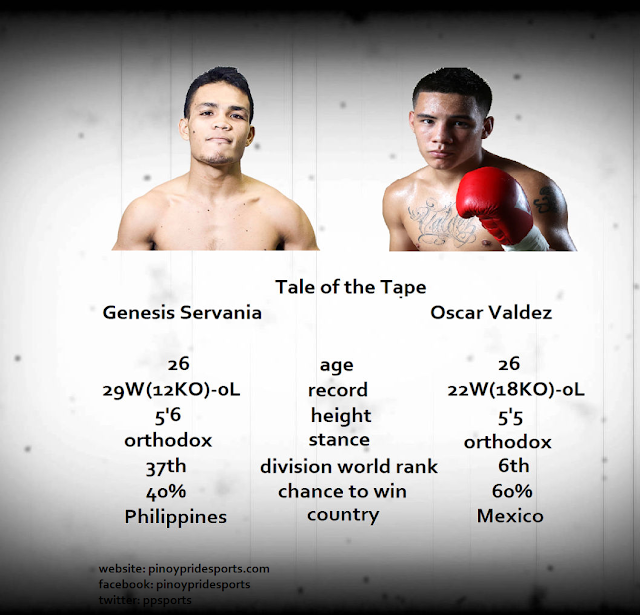 Let's check out the tale of the tape of the upcoming fight of both undefeated fighters Genesis Servania of the Philippines (challenger) vs the WBO World Featherweight champion Oscar Valdez of Mexico. Oscar Valdez has the advantage against the Filipino prospect Genesis Servania. But Servania now a different fighter much better than he was before. He is now trained by the Japanese promoter and now got his immediate opportunity to fight for a world title. Nothing to lose for Servania, but I think it would be a tough fight. Oscar Valdez vs Genesis Servania is a co-main event of the fight between Gilberto Ramirez and Jesse Hart WBO World Super Middleweight Title fight on September 23, 2017, at Convention Center, Tucson, USA.